This article is about a “two-strings scale” sometimes called Memphis Scale. Normally these two strings are not adjacent strings, instead you skip one string and play licks e.g. on the D- and B-string (as in the video examples below), or on the G- and high E-string. With the help of these licks you will increase your vocabulary on the guitar. Whenever you are in danger of running out of ideas or feel chained to a standard (e.g. the pentatonic) scale, these melodic, two-voiced licks guarantee a sudden change and a new colour in your way of playing. How do these licks work? First, have a look at the following chord, in this example a G major chord at the 7th fret (the video examples start with a C chord in the open position). We will build licks that are played on the D and B strings. The notes of this G major chord on these strings are coloured red (the note B on the D string, and a G on the B string). Below you can see a second way to play a G major chord, it is at the 10th fret position. 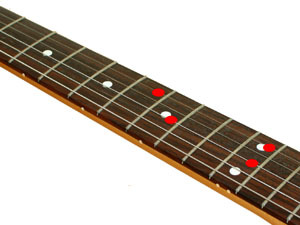 Again, the notes on the D and B strings (this time a D and a B) are coloured in red. The next logical step is to add certain “connecting” notes to create smooth transitions from the first position of the lick (8 and 9th fret) into the second position at the 12th fret. These notes are the C (D-string 10th fret) and the A (B-string 10th fret) – on the picture these notes are green. This is a typical pattern (here for G major) and many licks in the video are based on it. Which Fingers of the Left hand? 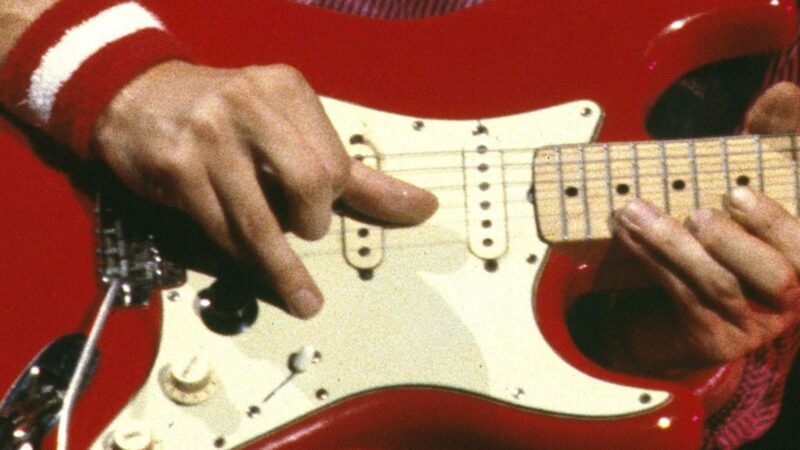 As a rule, always use the second (middle) finger of the left hand for the notes on the D string, and the first or third finger for the notes on the B string here: use the first finger if the B string note is on a lower fret than the D string note, the third if it is on the same fret. Both fingers stay in touch with the strings whenever possible. If your connection is too slow to watch this video in high quality, go to youtube and watch it in normal quality. Which key is In the Gallery on the first Dire Straits CD? Am or Bbm? Another great lesson – thanks. I love these intervals, although I know them as Country 6ths. As well as taking a chordal approach, you can build them on any notes of a scale, and using any of the strings. Especially combined with thirds, they give a great country sound, and are perfect for those lightning fast chickin’ pickin’ licks of players like Brent Mason or Albert Lee, as well as being an essential part of MK’s arsenal of course. Thanks Ingo – that was really informative. When you get a chance, how about a lesson on Mark’s chickin pickin’ technique. This has always fascinated me. It seems pretty easy to describe, but much, much more difficult to execute correctly. Thank you for that marvelous article! Very enlightning and good to understand! Did you write the licks out on your own or do you have the complete songs tabbed out somewhere (I’m not very good at hearing the stuff out so I always have to rely on sheet music a bit)? I really like that article, especially the licks, thank you again! Very, very interesting. This opens up a lot of doors. Thanks for putting this out. I have been following Mark’s playing since the Dire Straits’ first album; he inspired me to take up guitar as a hobby. You have explained some of the background to the music well, integrating a little theory where it makes sense. Good job! Keep on doing it if you can.